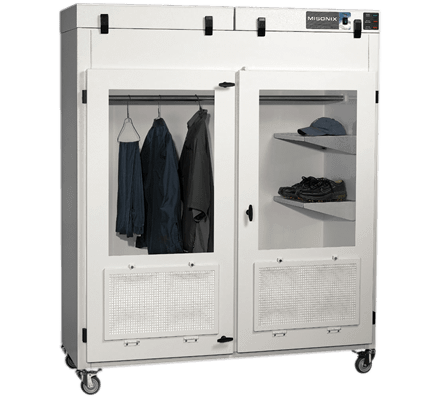 FR‑Series drying cabinets are constructed with a durable and rigid powder coated aluminum frame, while the interior drying chamber is molded from fiberglass. Added security comes from the powder coated aluminum doors with keyed entry, not found on other drying cabinets. This reinforced aluminum door is designed to provide a tamper resistant barrier while creating a positive seal between the chamber and the environment, minimizing the potential for cross contamination. The lower portion of the aluminum door houses a high efficiency pre-filter to block airborne contaminants from entering into the drying chamber. Once the aluminum door is locked, access into the chamber is eliminated without authorization. A clear viewing panel allows law enforcement professionals, tasked with handling ″wet″ evidence, to view the progress of the drying cycle. In addition to the door pre-filter, within the drying chamber is a second pre-filter. This pre-filter is referred to as a trace evidence filter and is designed to trap any potential evidence that may become airborne during the drying process. All drying air must pass through the trace evidence pre-filter before leaving the drying chamber. This filter should be changed between each case and retained for further analysis by laboratory professionals.